Well, February 15, 2013 is rapidly approaching and, with it, my own 'year of firsts' is almost over. I've made it through Mother's Day, my own birthday, Father's Day, Dad's birthday, Mom's birthday, Thanksgiving, Channukah, Christmas and New Year's with a lot of support from my very loving friends. I've wallowed briefly in the grief that invariably occurs but I've also learned a lot about myself and life in general. The year has been, at times, trying, but it has also spotlighted just how well my parents prepared me for life in general. I've certainly missed Mom (and Dad) and have had some low times but I've also had some wonderful times as my friends and I continue to laugh at her and Dad's antics. Neither parent is far from my thoughts and, as we approach the 1 year anniversary of Mom's death, the grief comes back in smaller waves these days. The sense of 'a new normal' is occurring and it's not a bad normal at all. I've spent a lot of time this past year reflecting on exactly how lucky I am to be sharing my life with the best man on earth and the best friends on earth. They've been there right when I've needed them - always. And, they've given me space when I've need it - always. I've also made some amazing contacts this past year on the internet - people who have found me through my internet writings on senior caregiving and have reached out for advice or help. I've come to understand that I was a pretty good caregiver, even though I learned by the seat of my pants. I've found that, by helping those who reach out, my own grief is lessened. I've also written another eBook which will be published on Kindle shortly. 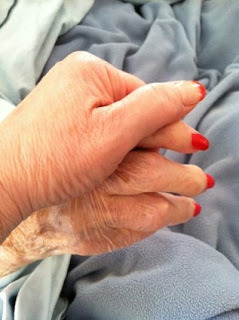 The working title at the moment is "Senior caregiving 101 - things I wish I had known'. It will be the first in a series of caregiving books I hope to write. And so, as I turn another corner and head off into the rest of my life, I can't look back on 'the year of firsts' as a bad year at all. In fact, if possible, I've grown even closer to my parents as I listen to the lessons they taught me. Lessons I cherish and heed. Here's an article I wrote on Squidoo about Surviving a year of firsts. Thank you for writing this blog! It's very inspiring. I have a good friend (long distance friend) that has lost his mother (very abruptly) and he is having an incredibly hard time. I want to be a good friend to him in any way I can but i'm at a complete loss as I live so far and we only communicate through email. Do you have any advice or suggestins on what I could do to make him feel supported? I've read many books but a lot of them require I be there in person and unfortunately I can't (I live out of the country!). He's told me he doesn't want to lose contact with me and wants me to keep writing to him but I have NO idea what to say as I don't want to make him sad or angry by talking about my own mother or about my boring life. I just saw your comment and, first of off, just 'being there' is the most important thing. So many people don't know how to handle grief and they just sort of disappear. The fact that you're interested in finding ways to help him is inspiring. And, please NEVER underestimate the support you give him just by letting him vent in emails. Although you might be long distance, you're important to him and your support is paramount to his continuing on. I'm so very sorry for him. Please give him my condolences. Also, why not suggest that he join the facebook page I started? It's a new page but there is support there too. I forgot to say that it's been about 4 months since his mother died. hugs....lots and lots of hugs! I found your blog via your squidoo site as I was googling dementia in the elderly; my own mom is 95 and beginning to show signs of it. I am 51. Seems you've walked down this same pathway. I write a lot about my mother on my own blog. And I bet you might have quite a bit of advice and tips and wisdom for me. Glad I found you.